Life as Celebration—Sakyong Mipham Rinpoche & Lodro Rinzler teach at Karme Choling. Under a beautiful blue sky full of wispy clouds on a surprisingly warm Friday afternoon in May, I arrived at Karme Choling. This 700 acre retreat center, nestled within Vermont’s Green Mountains, was the location for the “Life as Celebration” retreat with Sakyong Mipham Rinpoche and Lodro Rinzler. It was a perfect setting to explore “how meditation can uplift our lives, our households and our society.” I was greeted with smiles, hugs and laughs. There are few places on Earth that welcome and accommodate as well as Karme Choling. Registration was a breeze as all 200 of us settled in for what was to be a powerful and certainly celebratory weekend. After filling our bellies with delicious tacos in the dining tent, it was time for the first talk of the weekend. All of the talks and practices were held in the Pavilion, which in my opinion, is one of the most beautiful rooms I’ve ever practiced in. The juxtaposition of old wood sourced from the barn that was torn down, along with an elegant Shambhala shrine, a stunning throne and an intimidatingly large gong made for a magical mix of energy. Lodro is well known for his books, The Buddha Walks Into A Bar… and The Buddha Walks Into The Office. He warmly greeted us and we were off! Motivation was the centerpiece of his talk, specifically the motivation for attending the program. None of us were there by accident and some had traveled all the way across the country for these teachings. Saturday began bright and early. Some of us went to an optional early sit before breakfast, then at 9am the teachings began. Lodro started us off with some shamatha meditation and then an exercise in which we constructed our personal mandala. This was a practice that gave us insight into what we keep in close relationship to. Basic goodness was in the center and we contemplated what it might be like if basic goodness manifested deeper in these relationships. Shortly after the end of the discussion, Sakyong Mipham Rinpoche arrived. The Sakyong’s talk cut straight to the heart of the weekend: celebration. To be able to celebrate, you have to let go of hesitation and doubt of one’s own worthiness. It takes courage and gentleness towards ourselves to appreciate life. With deep skill, heart and humor, the Sakyong transmitted the teachings of basic goodness to us with unrelenting generosity. He pointed out to us that when we apply basic goodness to our lives, we are contacting reality itself. One of the most memorable parts of the talk was when the Sakyong recounted a story about his father, Chogyam Trungpa Rinpoche, in which he gave the essential instruction…smile! The Sakyong’s talk was beautiful and profound, and the sense in the room was that it went straight to everyone’s heart. What a reason to celebrate! 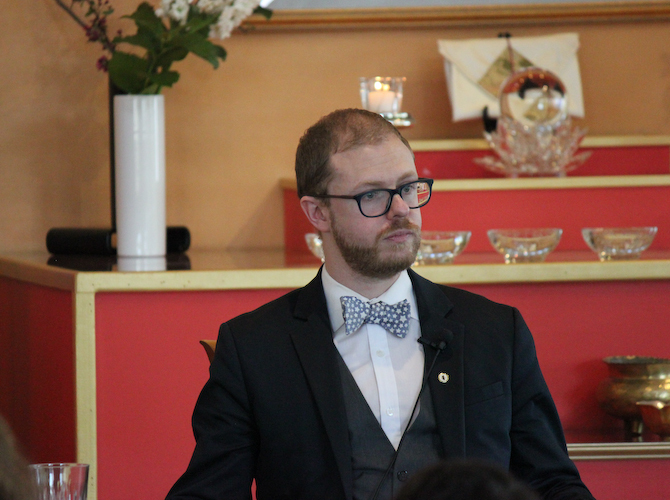 We broke for lunch, then work assignments and returned to the Pavilion for another talk from Mr. Lodro Rinzler. Lodro crafted his talk around the elements the Sakyong had laid out for us earlier that day—hesitation and doubt. When we can overcome them, we can celebrate fearlessly. Like a powerful wave that might sweep us away if we fight it, diving into it is the way through. This spoke of threefold trust: trust of self, other and the situation. That night we had a bonfire on the front lawn with true celebration. It took the form of sharing stories, riotous laughter, songs sung and of course s’mores! The only think that was possibly more powerful than our celebration were the flashes of lightning seen over the hills to the north. Even the phenomenal world was celebrating with us. We arose Sunday morning to low clouds sliding their way to the east across the tops of the hills and a symphony of birds. Finding their homes, fighting for territory, finding mates and undoubtedly celebrating in their own avian way. Lodro began the day by observing that the vibe in the room was “perky,” and we certainly seemed to agree. He guided us through a contemplation on the basic goodness in ourselves, in others and in society. He asked us what will we bring back to create society, pointing out that shifting small societies can bring about significant change, but it can seem overwhelming if we look to change the big picture directly. The Sakyong then arrived and spent the entire morning with us. He began by transmitting Shambhala Meditation, which was truly a gift. This practice offers a direct path to the fruition of the weekend: true celebration. Rinpoche discussed many topics, including: working with oneself fearlessly, the celebration and goodness in the mundane experiences of our lives, human healthiness and finding the ability to relate to the reality of who we are. There were two items that truly stood out for me, which Mr. Rinzler discussed again in the evening talk. The first was that as situations become more intense, so does the warrior. The Shambhala warrior overcomes doubt and hesitation as the intensity of life rises. The other was that this isn’t about saving the world, it’s about serving it. Lodro ended the program by recounting the stories of Dawa Sangpo, Chogyam Trungpa Rinpoche and Sakyong Mipham Rinpoche. He also discussed the ways in which Shambhala manifests, made suggestions around practice and study and talked about how we can bring all of this home with us. This was truly a remarkable program, taught with such skill, hosted with such care and attended with such heart. Although all of those qualities could apply to all aspects of the weekend. I’m thankful to have been there for that moment of celebration! 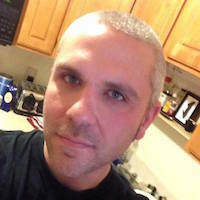 Keith Huston is a New England native and has been active in the Boston Shambhala community for the past 6 years. When not coordinating programs or overseeing the technical needs of the center, he brings his practice to corporate life at Bose.